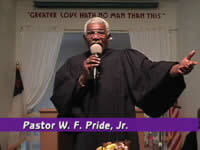 Pastor Willie F. Pride, Jr.
Pastor Willie F. Pride, Jr. was founder of Everlasting Missionary Baptist Church in Vancouver, Washington and he was the senior pastor for 30 years. He was called as an evangelist, and has preached revivals throughout Washington state and Oregon, as well as in cities across the United States. He was an officer in the North Pacific Baptist Convention for five years. He has performed hundreds of weddings and baptisms. He has also been active in prison ministry, hospital ministry and nursing home ministry. In August 2015, Pastor Pride was installed as Senior Pastor of New Jerusalem Missionary Baptist Church of Yakima, Washington. He is currenty a member of Yakima's Ministerial Alliance. Some of his sermons are available to watch on YouTube. He is the author of two published books of sermon collections: "God Wants You to Do His Will" and "Everyone Needs Jesus," available here.